About 100' later, the jig under the bobber was hit. Just as I netted that fish, the other rod took a solid hit and I hurriedly boated and released (hence no picture) what looked to be about a 12" Small Mouth. The other rod was stripped of it's minnow. Just a short time later my wife called and asked if I would like to go to the movies this afternoon. 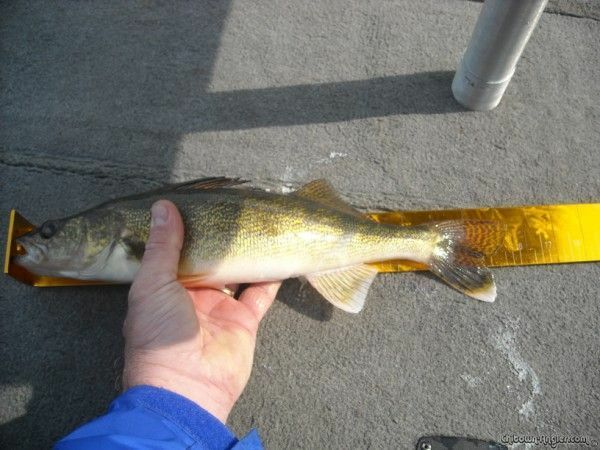 Since I had removed the skunk from the boat, I decided to release the Walleye and head home. So I brought home nothing but a few minnows (here trout, trout, trout), but that Mr. Walleye got to spend some time in my live well. If I would have gotten a second one, we would be having Walleye for dinner instead of Chicken Fried Steak. Course, I likes me some Chicken Fried Steaks too. Nice eye. What lake were you on? Good report Pops! Glad ya caught something, but where did ya find that good catch- somewhere in Zion? I love chicken fried steak! a little more often. There is something that you normally don't post. no spinach with dem chicken fried steaks? Chicken Fried Steaks were put on hold as we kinda pigged out on popcorn at the theater and decided on sammiches for dinner. CFS is set for Wednesday night now. atta boy Pops!!! You prefishing for that tourney already? Hmmm...nice day wed...can you say....Inland trout? The perch gods were frowning on you but the Chain proved worthwhile for you. ICE CAV "Death from Above"
I wouldn't say prefishing exactly, but I was in one of the areas that we will probably visit when we do go out. Even the guy putting his dock in didn't scare the fish away. I have a few minners (heavy dozen) left over for Wednesday. As of this afternoon, they were doing fine (after I changed out some water and got the ammonia levels down again). Chitown-Angler was started on February 10, 2003 and has received 207966542 page views in total since that date.